I know I've been showcasing a lot of desserts for St. Patrick's day over the past couple of weeks, but this is the last one. And it is so simple to toss together, but kicks a lot of flavor. In my house, it comes highly kid-approved. Bring applesauce and jello to a simmer over medium heat. Remove from heat. Stir in lemon lime soda. Let cool in fridge 10 minutes until slightly thickened. Spoon into individual serving dishes, and refrigerate until set. Enjoy! Readers, do you have any special plans for St. Patrick's Day? Recipe looks and sounds good. St. Patrick's day is extra special to us...our first grandchild was born on that day! This sounds fun, I think I have had similar. I make corned beef and cabbage, inviting whoever wants to eat. I like the leftover meat for hash and sandwiches so make an extra roast. I know some kiddies that will like that! Thanks, Lisa. Yes indeed, it does sound and look so yummy! I AM going to make this! I will get the stuff tonight. That plate is gorgeous! 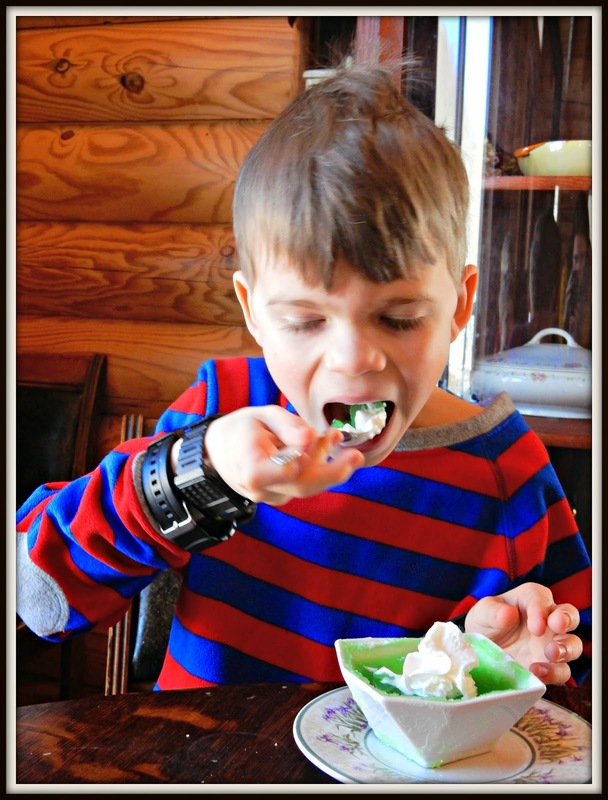 This sounds good, and Pierce seems to be concentrating very hard on eating that dessert! :-) Is he wearing 2 watches? Your kids are so cool! Nope, we celebrate St. Andrew's day on 30, November. Kinda. I bet the applesauce gives it a nice texture, compared to just plain jello. That looks great and sounds delish! That looks good! I don't have any plans for St Pat's. I usually forget and then one of my grands will get a kick out of pinching me. Sounds good and gets some fruit in them. I found the Rescue Remedy at Walgreen's - thank you. 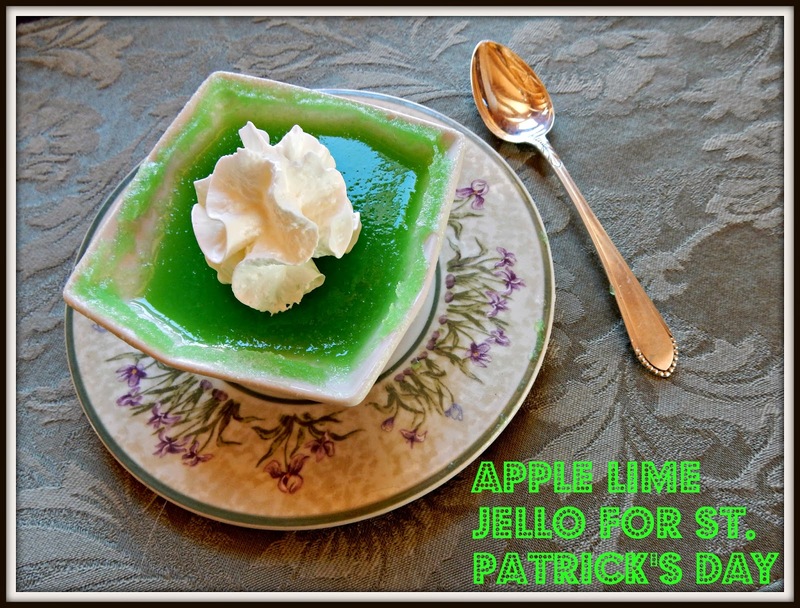 I always make lime jello parfaits for St. Patrick's Day. I'm not a lime fan, though, so I'm going to try your recipe! Getting closer...I bought the ingredients last night! No special plans. Love your pictures! Sounds delicious. I have to go through your blog to look at some of your other St. Patty's Day recipes. We have a party to attend!